I get emails weekly from consultants who are struggling to make ends meet. And this always makes me sad, because when you run a consulting business the right way you can absolutely print cash and really change your lifestyle for the better. Contrary to what some think, I’m not just about making money. Making money as a professional is a good thing, but it is just a means to an end. By making more money you can literally change your life, but money will not make you happier in and of itself. In fact, more money usually means new problems that you have to learn how to solve. And it’s proven that once you make $75k a year (~$6300/mo before taxes), money doesn’t make you any happier. If you’re working for yourself and struggling to make ends meet, I want to offer you some advice on things that you probably need to change so that you can grow your business and work fewer hours instead of constantly grinding out the hours to get paid. In this post I am speaking directly to individual solo consultants, not agencies. Agencies are a different beast than a solo consultancy because of headcount, account management, ability to offer more services, and more. Here’s your blueprint for building a profitable solo consulting business. Whatever your consulting, whether digital marketing or software development, you need to define the specific client that you do your best work for. the type of business you love working with. This will ideally be based off the kind of client/business that you have worked with in the past, whether at an agency or inhouse, because you will have a deeper understanding of the business and what the point of contact cares about. While it is smart to pick a niche that has a lot of opportunity, the reality is that as a solo consultant you can only really take on 3-4 clients at a time and stay sane and still reach the revenue you need to be able to support yourself/your family. Unless you are planning to grow a huge full-service agency, then I honestly recommend that you not really care about “opportunity”. Instead, if you want to stay self-employed for a long time then find the clients that you love doing great work for. That is worth way more than “opportunity”. Consulting is a business. Even if you are doing it on the side, to be profitable you need to bring in more revenue than it costs you in time to deliver that work. We need to talk about goals. Everyone hates talking about money, but this is where you get real with yourself to discover how you need to price yourself to make consulting worth your time. There are a few realities you must take into account before you find your minimum hourly rate, though we’re going to discuss further down how to get away from selling your hours so that you can actually scale and not work 80 hours a week. The reality is that on the side from the actual client work, you have to do client management, sales, marketing yourself, and also allow for some days where you are less productive than you’d ideally be. Don’t book yourself for more than 30 hours of client work a week, ever, unless you accept that you’ll be working 50+ hours a week if you do. Second, recognize that you are now the one who has to pay taxes on the money you bring in. So if you bill 30 hours a week at $100/hr, you may be billing $12,000 per month before taxes. If you are a pass-through LLC and have $1000 of expenses, then you have $11,000 of profit and will have to pay ~$3k of that $11,000 in taxes. So realistically, you have ~$8,000 from that $12,000 you’ve billed. Now you get to do some simple math to determine your base pricing. Note that this is not your upper limit pricing, but rather the minimum that you need to make per hour of work to simply make ends meet. Let’s say that you want to clear $100,000 per year in income after taxes. That is $8,333 per month. This math is pretty easy, as we’ve already done it above. You need to bill ~$12,000 per month to hit this goal, if you accept that you are going to work 40 hours per week every week of the year (we’ll get to that in a bit) and only 2/3 to 3/4 of that will actually be billable. There you have it. If you want to make $100,000 in a year after taxes (and are keeping your expenses low), then you need to on average bill $100 per hour. Not to burst your bubble here, but there are two more realities that you need to take into account. You will need to take some time off. You can only grind for so long and at some point you are going to need a vacation. This eliminates 25-30 hours of billable time from that month. Projects almost always go beyond their intended scope. You need to account for ~20% creep on hours worked. You might think you only need to bill $100/hr to make the money you want, but I always recommend that you take the price you’d do it for and then add 20% on to the price. If you’d pitch the project for $2,000, pitch $2,500. If the value is there and it’s the right type of client, they won’t care about $500 to get the job done right. If they balk at that and try to negotiate back, then you need to consider if what you are offering is worth that and if they are the right type of client. Next, once you have that ideal client you need to define your offer in accordance with what you know your client needs and can afford. That second point is important. If you need to bill $10k/mo ($120k/yr before taxes and expenses) and you know that your ideal client realistically only has ~$1,000/mo to spend on marketing, then you have to take on a lot of clients to hit your revenue goals. You will also have a very hard time as a solo consultant doing services for clients like this unless you are very good at processes and automation. If your clients are larger businesses, then you can realistically sign 3-4 clients who each pay you $3,000+ a month and you will end up working a lot less than the person with 10 clients at $1,000 a month doing services. The reality is that some activities are worth way more to clients than other activities, based off the expertise required. To really structure your offer well at a price that your client is willing to pay, then you need to understand what the work is worth to them. I’m not going to go into ascribing business value to the activities that you are proposing, but if your client does not understand what additional traffic/ad spend/content/email marketing/better site speed/whatever you are offering will get them, then you will likely not be able to charge correct prices. Strategy – this is where your client has a team and you are directing them with the strategy of what to do and where to go. Services – executing upon whatever your client needs whether that is content development, fixes on their website, writing code for new features, and more. Combination strategy/services – this is where a lot of consultants end up. You are doing the strategy and then some of the work, while relying on the client’s team to execute on other parts that you do not offer yourself. At the beginning you will likely put together custom proposals for all of your clients. I recommend that you do this at first, but look at what the common needs are (aka what they are asking for) and then start “productizing” your offer. While a one-size-fits-all does not really exist, knowing the specific things that your clients will get is the best way to scale the work you are doing while staying sane and not working more hours. These are the things I do not do for clients. This way, you can much more easily say no to the wrong clients, yes to the right clients, and specifically message your services towards those right clients. How many times have you looked at a consultant (or agency) website and seen generic things like this? This is boring, bland, and not specialized. In the digital marketing world, I often blame keyword research for telling us that “SEO services” has more traffic and thus is going to get us more clients than something more specific. But remember what I said about only needing 3-5 clients at a time to run a profitable and sane consulting business if you structure it right? Let me show you something. Here is a screenshot from Credo’s analytics. I might get a lot more traffic from [seo consultants], but it does not convert well. However, the long tail (b2b facebook ads consultants, saas ppc agencies) converts way better! Each of these leads is worth multiple thousands of dollars. The more specific the query, the more likely it is to close as well. Would you rather slug it out to get top rankings for [best seo consultant] and receive a lot of unqualified contacts wanting “seo services” for $250 a month, or would you rather rank #1 for [b2b facebook ads consultant] and receive 4 leads a month that convert and will each pay you $2,500 a month? The choice is yours, but I know which one I would (and do) choose. To get started here, read Million Dollar Consulting (aff link). The biggest mistake new solo consultants make is billing by the hour. I do not think that billing by the hour is the right move for either the consultant or the client. I will also admit that I have done it from time to time, and every time I do it I regret it immediately. This is not sustainable and is a false truth. It is entirely possible to charge more by working less if you sell clients what will move the needle on their business and those activities are also high value to them. I always recommend selling recurring services to your clients. Whether that is a package of content targeting specific keywords that will increase their traffic and get them new leads, ongoing link building or training to help their team get more links that will improve their rankings and their ecommerce business revenue, or an audit plus keyword strategy plus training with their team on SEO strategy, you can pitch all of this as recurring. I normally take an hour or so to dive into the client’s site and needs, after I have had a few conversations with them and vetted them as a good potential client, and put together for them specifically what I think they need. Then I plan that out across a few months (or however long it will take me to deliver the work) and determine the hours that will be needed. Then I take my decided-upon hourly rate and determine how much they need to pay me each month. Then I pitch them on the work that will be done and the amount each month. I never tell my clients my hourly rate, as this could cause them to try to nickle-and-dime and negotiate on hourly rate. Never negotiate on your hourly rate if you want to run a profitable business. If you pitch the client on a big engagement and they are not able to pay it, then you can negotiate on the scope (to lower the price for them) instead of selling your time for less than it is worth. Finally, if your client is pushing back on your hourly rate then they probably do not see the value in what you are proposing and you’ve likely already lost the deal. You need to then do a better job up front of quantifying why your price is worth it to their business. In personal finance as in business, if you want to be profitable (whether to save for retirement or to pay yourself), then you need to spend less than you are bringing in. It sounds simple, but it’s true. This is where business operations can literally save your business. They literally take care of your P&L for you, which is the main number you need to track for the health of your business. I also recommend that you review your expenses every month, and then quarterly go back and look across your expenses to see what you are not using that you might still be paying for. 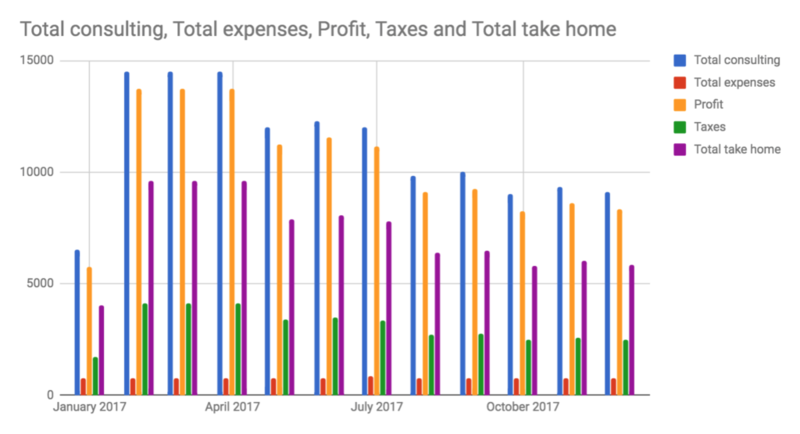 In December 2017 I went back through my monthly expenses and realized that I was paying for ~$600/mo in subscriptions that I wasn’t even using! Just by cancelling those subscriptions I saved my business $7200. What could you do with an extra $7,200? Finally, retention is the ultimate consulting business profitability hack. More consistent income without worrying about the usual feast and famine of consulting. There are many ways to structure your consulting so that you retain clients long term. First, communication. Every week you should be on a phone call with each of your retainer clients (this starts to break down around 4 clients, which is also why you shouldn’t have 10 clients at a time) to discuss what you’ve done, what they’re doing, and what you are working on. Monthly you should be reporting what has been done and what is being worked on. If your client does not have an Analytics team or is not tracking numbers that you can tie back to success, then you should discuss the monthly numbers reporting they need. This also gives you a chance to help them get better visibility into their business which improves their view of you as more than “a consultant” and gets you into the “business consultant” realm. If you can tie your work back to their business and show them how much more revenue your work is making them, then you will never lose that client and you can raise rates on them as well should it come to that. Finally, the more time you are spending billing/reporting is less time that you can spend doing work for paying clients. Get the point? Reporting/billing are overhead. They’re activities that you might (and should) be charging your clients for as being included in their retainer, but you can reduce the time it takes to do it and still provide them the same value. Never forget that your clients don’t need to know the amount of time it takes you to do something. If they are paying you $4,000 a month for something and it takes you 10 hours, then you’re making $400 an hour. If it takes you 40 hours, then you’re making $100 an hour. The client shouldn’t care. They’re getting what they’re paying you for. And what they are paying you for is your expertise. They should be paying you for results, not hours. So how do you automate your billing? This works very well for ongoing flat retainer clients. I also accept credit cards via Stripe, which FreshBooks integrates with natively, and am perfectly willing to eat the credit card fee in order to get paid on time and not manage checks and wondering if someone has paid. If you accept credit cards through Stripe using FreshBooks, then the invoice is automagically marked as paid once the credit card is accepted. If you have a slightly more complicated revenue model, such as a percentage of managed spend and a flat rate per channel managed, then you need a slightly different setup. The best advice I can give you here is to hire someone to do this work for you. The more time you spend determining what each client owes you each month, the less time you have to do work for paying clients! Billing absolutely needs to happen consistently, as sometimes clients can take longer to pay than your payment terms, but it can be done pretty easily by a trained eye that you can pay less than what you are worth hourly to your clients. This is also another way to get more time – pay someone less than you make yourself per hour, get more hours back in your day/week/month that you can use to either bill more from clients or take your dog for a walk. Reporting can be a bit harder to automate and how you do it completely depends on the work you are offering and what you are tying your work back to. I personally work with larger clients with dedicated analytics/data teams and so at the beginning we work together to get all of the important tracking in place. I also make sure to annotate their Analytics whenever a big release goes out so that we can tie performance back to changes we made. Another way to do it is Dashboards within Google Analytics, if that is what your clients use. The vast majority of clients do, so this is a great place to give your clients transparency into where the numbers are going (if you are doing digital marketing consulting, for example). If you are building websites or something for clients, then your work being completed is probably all the reporting you need. I tend to personally keep reporting for clients very light as I am working solely on strategy for them and doing audits, but agencies and consultants I speak with who do more services tend to also use tools like Klipfolio for easy dashboarding. What other questions do you have about running a profitable consulting business? I’d love to hear the challenges you have so I can help you out! Note: some links within this post are affiliate links, meaning if you buy something through that link I may get paid a commission. I only recommend products that I personally use and pay for. Thanks so much for sharing this info, John! I definitely can relate to falling into charging per hour. It wasn’t until recently that I just started shying away from that and even increasing my rates. And you’re absolutely right, if the client has an issue with your price, they’re not the right client for you. I know I never personally negotiate with other business owners on price because I know that time should not determine money. Experience and expertise should. It still can be a challenge communicating that though! hi John, Thanks a lot for this article. So much advice for me as i look to break out on my own. I’ll no doubt be coming back here a few times. Duly subscribed! I use Freshbooks but don’t love it aside from billing automation. Stripe should be avoided for Canadians as billing takes 7 days for some reason but they say they are working to changing this. I would also say to avoid cheques and offer incentives for early payment. PayPal works but Elavon if you are doing any volume is ideal for a lot of savings. Thanks for the feedback, Adam! When you say 7 days, is that to process or to get into your account? Honestly I don’t know that that is such a big deal because if you’re doing this right, then you’re not living payment to paycheck. Ideally you’ll have a balance that you can invest into other areas and pay yourself consistently. I would avoid PayPal for anything major, as they’ve been known to freeze funds. And yes I agree to avoid checks. In order of what is best, ACH > Stripe/credit cards > cash > checks.